I picked up the Moleskine Ballpoint Click Pen (MBCP) at Staples off the clearance rack for a mere $6. Which compared to their original MSRP of $15.95 is a steal. Inside is a standard parker style ballpoint refill. Sadly Moleskine didn’t think to use all the same refills across all their products, so this one uses a Parker style refill, another pen uses their gel ink refills and so on. The ballpoint refill is pretty meh. It does the job but my wife described the experience of using it as scratchy. I don’t find it scratchy but it isn’t smooth, not at all. Outside of the meh refill the feel of the pen in use is weird. First let’s discuss that shape- a rounded over rectangle that is thicker than a carpenter pencil but also not as wide. It is, as my wife said, shaped funny. The flat shapes never seem to settle into a good place in my hand and I’m constantly wanting to rotate the edge away from my thumb, but then the narrow shape sits on my middle finger and feels off. The shape is just not comfortable for longer writing. It’s too weird. For quick notes it’s ok. The pen is extremely light weight. 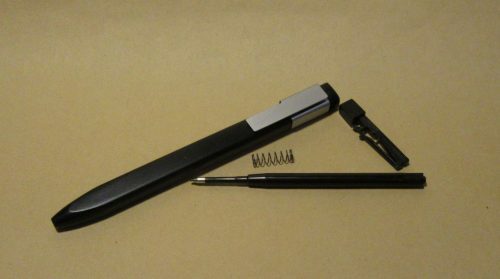 It’s made of ABS plastic, similar to the Lamy Safari, but unlike the Safari, the MBCP feels thin and cheap. I am not sure exactly why I think it feels cheap but it feels insubstantial. The thin metal of the clip feel too pliable and easy to damage. The seam is visible and unsightly. Though the clip is too thin, it is a genius design. 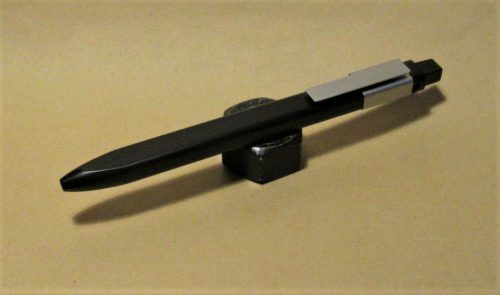 It slides over the fore edge of your notebook/journal, keeping the pen flush with the book and at the ready. I’m in love with the clip and I really wish that the writing experience was up to par with the clip. 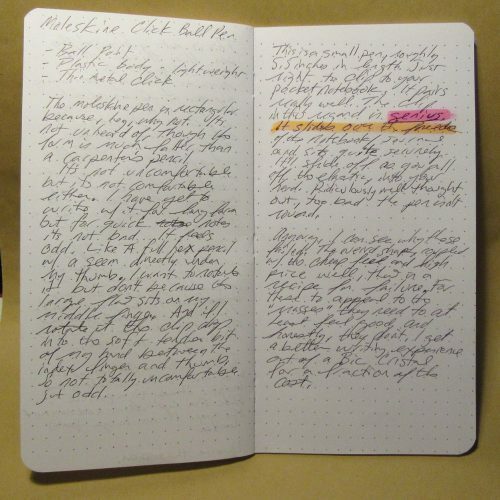 Moleskine is no longer producing these pens, so I’m late to the game but here is where I think that a company could have reached out to the large community of Moleskine and pen enthusiasts across the world. I’m pretty sure they’d have been told- the shape is too weird, the pen feels cheap, among other issues. Instead they got caught up with their own design and drank their own Kool Aid. Slap a Moleskine logo on it and it’s sure to sell. Sorry Moley, you put a cheap product on the shelf for $16 across the aisle from a whole assortment of pens people know will work well for less money, and most people are going to buy the 10 pack of InkJoy for $15 instead of the weird rectangle pen. Which is why we see so many of these on clearance racks at Target and Staples- they don’t sell worth a damn because they are overpriced and don’t perform. I get better performance from a Bic Cristal at a fraction of the price. 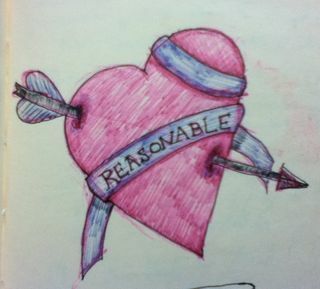 This entry was posted in Review and tagged eww, moleskine., pen on 20170622 by leslie. I’m reviewing the case bound Gamma series and I’m not going to mince words here, these are the best sketchbooks I’ve ever used. The paper is a heavy 100lb and ivory in color with a slight texture. 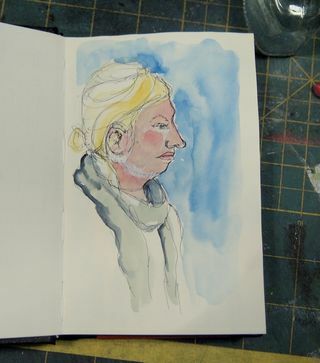 The sleeve states it can take “light washes” of watercolor and is good for a variety of materials. I found all that to be true, plus it handled heavy applications of watercolor like a champ. The covers of the case bound gamma are super tough and very sturdy. They hold up well to sketching in the hand while standing. Though it’s humid here they remain flat. The binding is perfect. I can find no flaws with it. The thread matches the paper color so blends in well and is not noticeable. The stitching is the same sort of binding that Moleskine sketchbooks use, smythe sewing. This also with some work allows this sketchbook to sit VERY flat. It does take some work to get it to open perfectly flat. That work is as simple as opening the sketch book up over and over again and touching the 2 covers to one another. Easy. It’s really nice to work in a sketchbook where I’m not constantly battling the paper with either my ink or watercolor. It’s nice to lay down a wash and KNOW how it will respond to either more color or to water being used to lift that color. I know that if I add more lines to the page how that ink will respond. While I adore my cheapo canson blue book for hashing out ideas and mind mapping, using paper I don’t have to fight with is the whole reason i got into bookbinding so many years ago. If Stillman and Birn had been around in 1998 I never would have started making books. You can get them at EuropeanPaper.com Not sponsored just a happy winner of a sketchbook from them. 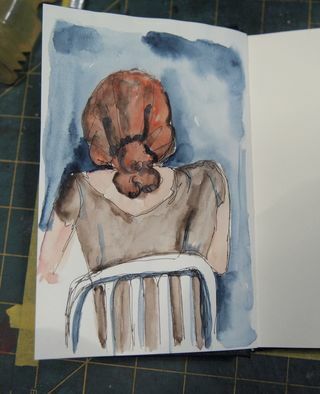 This entry was posted in Review and tagged birn, moleskine., sketchbook, stillman, stillman and birn on 20120705 by leslie. 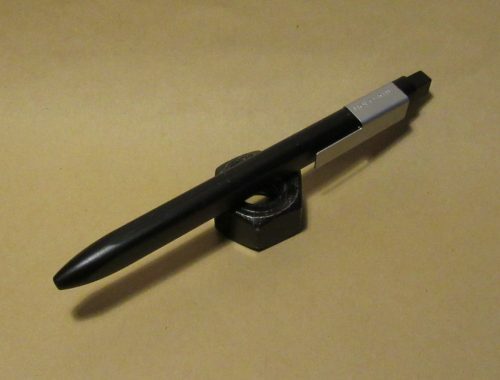 The Space Pen is a standby pen for me. 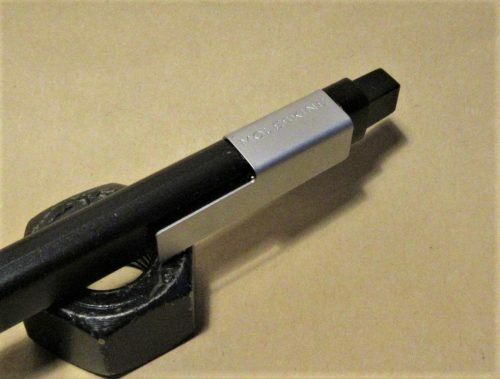 I love its compact shape that extends to a full sized pen when used. Similar in size to the old school joy that is a Parker Jotter its just comfortable to use. I’ve got 2, a brushed chrome version and a stealthy matte black, the chrome with black ink and the black with red. My go to ballpoint pens when a ball point must be used. I used them religiously for my GTD system back in the day. Black was for regular entries- to do stuff things that needed managing. I had a lot to manage 6 years ago, as the manager and buyer for a busy floral department. My GTD system is well documented here. It was a simply take off of PigPog’s system of a simple line on the outer side of a moleskine Volant or cahier, blank pages please. I’d enter a date and action item, then as it was finished cross it off the list. 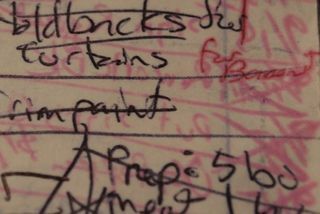 Items that were desperately urgent were marked or boxed with red ink. And this is where things get interesting. 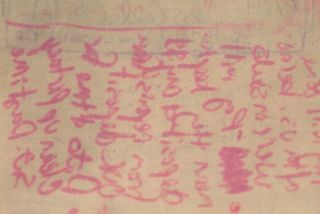 I was going through a notebook and I noticed that the red ink had ghosted through the page and in some cases ghosted onto the facing page. in some cases this is no problem, I doodle, a lot and obviously ghosting of doodles wasn’t much of an issue, BUT when I had take notes in the red ink, it made the next page of notes hard to read. I noticed this about a year after I had initially taken the notes. It hasn’t gotten any worse over the years but it is interesting. It occurred on ALL the papers I’ve taken notes with- old issue Moleskine Volants (w/ the GOOD paper), Wausau Ivory paper 24lb, Staples/ hammermill ivory 24lb, and various other papers. It also only occurred with the red SpacePen ink, not the black or blue. 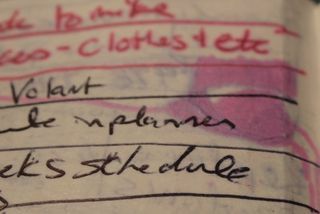 This entry was posted in Review and tagged fisher, gtd, moleskine., red ink, spacepen, to do list on 20120510 by leslie. Thisis Moleskine #4 I filled it up while I was in Buffalo, NY attending a funeral for a family member and shortly after. A visit to Buffalo is always interesting. Anyway, the idiots have been thumbing down my videos again. It's driving me nuts. It just reminds me of the need to thumb OTHER people's videos up. If I like a video I always thumb it up. I figure it does something to restore some balance to the positivity of the world. Anyway, go check out my vids and give them some love. 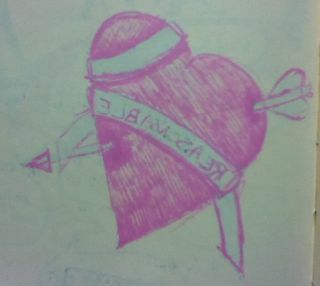 This entry was posted in Uncategorized and tagged art journa, buffalo, family, funeral, journal, moleskine., NY, sad on 20120117 by leslie. This sketchbook contains 80 roughly 110lb plain cream colored pages. They are contained within plastic covered hard black covers. The plastic is imprinted to look like leather. 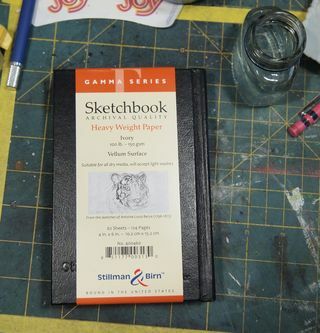 This sketchbook is very often suggested for people started out in art journaling. The paper is stiff and smooth. It’s good for writing and drawing. I find that the paper has a coating that repels wet media like watercolors, which it absorbs but gives a blotchy appearance. It does the same with some inks. It can be quite a pain in the rear. I’ve found that if I got through my sketchbook and spritz the pages with a little water so they are evenly damp and then allow them to dry before working in watercolor or ink the blotchiness is minimized. The paper responds favorably to pitt and zig pens. They remain perfectly black and don’t show any blotchiness. The paper is also heavy enough to support many layers of collage and acrylic paint. When working with wet media it’s best to be aware that the paper will cockle and remain wavy even after it dries. I like the wavy paper but most don’t. The heavy weight paper does not show strike nor bleed through except when using sharpies and copic markers. Fountain pens do just fine on this paper. Some fountain pen inks get blotchy. The sketchbook has a great form factor with its smooth hard black covers, pocket in the back and elastic closure. I can’t say that the paper would be a reason to recommend it. The pages can take abuse but if you erase too much or scrub the pages with a brush you’ll end up will pilling of the top of the paper. I’ve read reports of the spine breaking on these sketchbooks but I’ve abused the heck out of mine and never had a broken or damaged spine, and I’m not gentle with my sketchbooks and journals. The price however is quite prohibitive at $18 for 80 pages. If you are looking for a sketchbook that handles a variety of media relatively well, with a nice hard cover, at a ridiculously high price this is a good sketchbook. There are others similarly shaped and sized that will work as well at a lower price. This entry was posted in Review and tagged art, journal.sketch.book, moleskine., review, sketchbook on 20110127 by leslie. 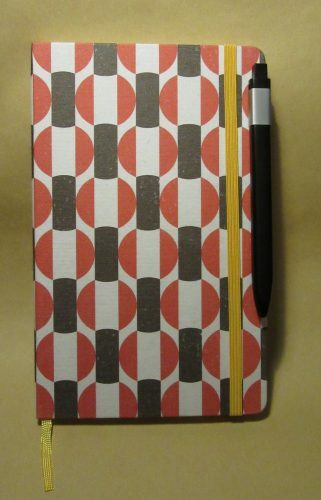 About a month ago I was contacted by Chronicle Books about hosting a give away on my blog of products from the new Moleskine line of products. Unable to say NO to anything free, I accepted. I expected a small amount of products, one or 2 sets of books. Instead I received, via Fedex, a large box. In it were several colors and sets of the 5×8 Volants, a set of the pocket sized volants, a desk calendar and the hottest thing in there, several Color A Month Planners. This entry was posted in Journaling and tagged books, calendar, chronicle, gtd, journal, moleskine., planner, volant on 20091107 by leslie. Love the packed pages of robobop's moleskines. There is so much going on I don't know where to look All I know is that no matter where I look, my eyes are happy! 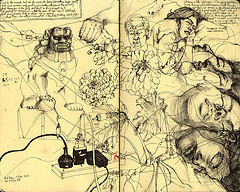 This entry was posted in Inspiration and tagged art, draw, inspiration, moleskine., sketch on 20090813 by leslie.